In the spirit of randomness and crippling indecision, I’m going to let my lovely readers choose my next work in progress! (Because, really, what’s one more WIP?) 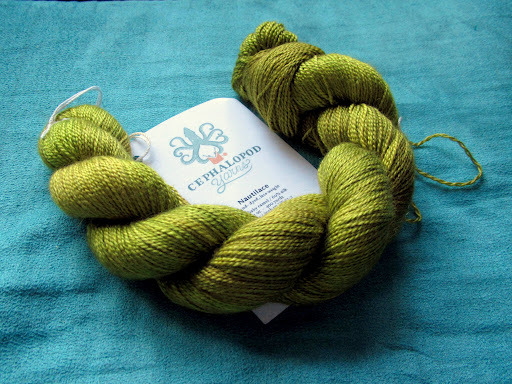 I have this fantastic 400 yard skein of Cephalopod Yarns Nautilace which I envision as a lacy, lightweight, uber-stylish long cowl… but which one? This is the Jeweled Cowl designed by Sachiko Uemura. It is a beautifully simple design that lets the beads shine. I have some pale blue beads that would work well. I’ve done a couple of beaded projects in the past, beading isn’t difficult but it is rather a pain in the tuckus and definitely slows one down. Yet I do love the look. 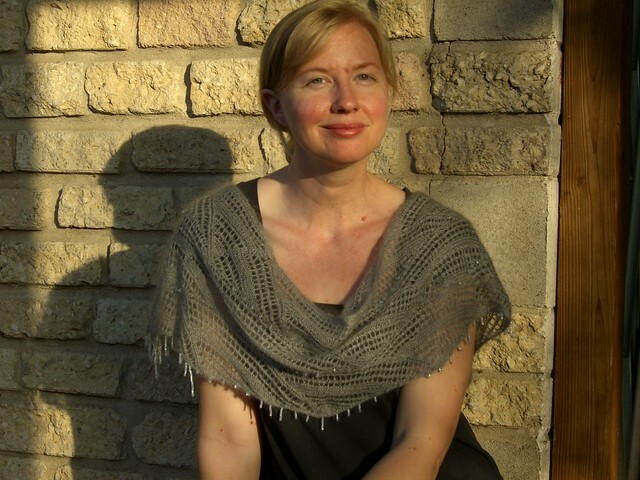 This is the Thundercloud Cowl designed by Snowden Becker. I like the all-over lace of this one and am intrigued by the beaded fringe action, which I haven’t seen before. I just hope the lace pattern is easy to remember because I need my projects to be portable in order for me to ever actually finish them. 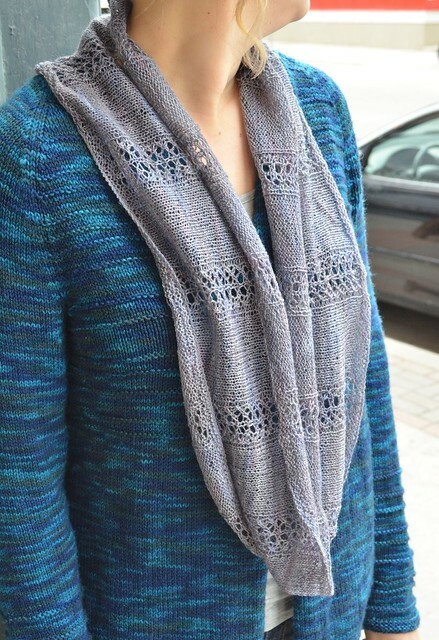 This is the Hunter St. Cowl designed by Glenna C. This one seems less airy than the others (more tightly knit) but I really love the lace inserts an think they are set off by the plain knitting nicely. So, which do you like best? Least? Which would you most likely enjoy knitting or wearing? 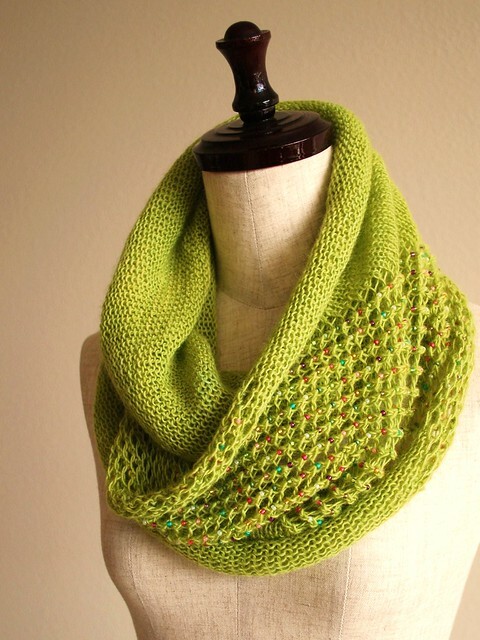 Please leave a comment below and help me choose between cowls 1, 2, and 3! This entry was posted in Uncategorized by shoelaceswitcher. Bookmark the permalink. I agree with Lisa. 2 looks gorgeous and not as slow as the beaded cowl which is also beautiful but would definitely take longer to finish. I'm going to have to say cowl #2, as well! They're all lovely, but I'm especially enamored by the lace pattern and the beaded fringe. Looks like a fun knit!